1, What is your time of making samples9 Usually we will take 1~3 days to make the samples. 3, What is your delivery time9 The time of delivery normal is four weeks after we receive the deposit. 8, How about the samples9 We could send you the samples but the freight are charged. Our factories have predominately Italian machinery which can meet highest standard of production. 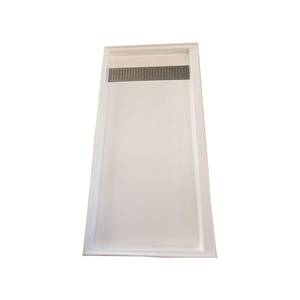 As one of the most professional manufactures in China, we always provide our customers with best available meterials for commercial and residential projects. Our main objective is to guarantee that our customers have trouble free dealings and great results. 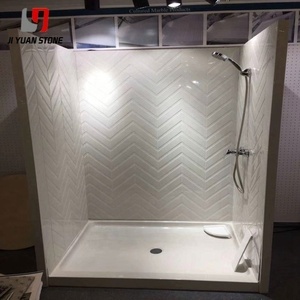 AIO HOSPITALITY SOLUTIONS has it's own factory to manufacture USA hospitality cast marble shower surround, tub surround, wall panels, cultured marble shower pan, shower base, shower tray, shower walls, cultured shower wall accessories, soap dish, accessories ledge, shampoo shelf, trim, foot rest, corner shelf Specification Product Shower Pan , Shower Tray, Shower Base Material Cultured Marble,Cast Marble Model Trench Drain with Stainless Steel 304 Cover Dimension 60"x30"/32"/34"/36"x4" Surface Textured, Non-Slip Drain Location Off-set (Left & Right) Drain Opening US Standard Color Solid White Front Curb Integral 3"W * 4"H Flange 0.75" on Side and Backwalls Features: 1) Solid one piece construction; 2) Abrasion Resistant Gel Coat Surface 3) Seamless 4) Pre-leveled 5) Easy to install AIO HOSPITALITY SOLUTIONS has over 10 year experience to manufacture cultured marble shower surrounds, shower pan and accessories. We provide products directly for US hotel projects and apartments. AIO HOSPITALITY SOLUTIONS has it's own factory to manufacture USA hospitality cast marble shower surround, tub surround, wall panels, cultured marble shower pan, shower base, shower tray, shower walls, cultured shower wall accessories, soap dish, accessories ledge, shampoo shelf, trim, foot rest, corner shelf Specification Product Shower Pan , Shower Tray, Shower Base Material Cultured Marble,Cast Marble Model Rectangle Shower Pan Dimension 60"x30"/32"/34"/36"x3", 48"x36"x3" Surface Textured, Non-Slip Drain Location Corner Drain Drain Opening US Standard Color Solid White Front Curb Integral 3"W * 3"H Flange 0.75" on Side and Backwalls Features: 1) Solid one piece construction; 2) Abrasion Resistant Gel Coat Surface 3) Seamless 4) Pre-leveled 5) Easy to install AIO HOSPITALITY SOLUTIONS has over 10 year experience to manufacture cultured marble shower surrounds, shower pan and accessories. We provide products directly for US hotel projects and apartments. 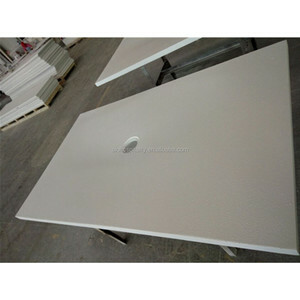 AIO HOSPITALITY SOLUTIONS has it's own factory to manufacture USA hospitality cast marble shower surround, tub surround, wall panels, cultured marble shower pan, shower base, shower tray, shower walls, cultured shower wall accessories, soap dish, accessories ledge, shampoo shelf, trim, foot rest, corner shelf Specification Product Shower Pan , Shower Tray, Shower Base Material Cultured Marble,Cast Marble Model Rectangle Shower Pan Dimension 60"x30"/32"/34"/36"x3" Surface Textured, Non-Slip Drain Location Off-set (Left & Right) Drain Opening US Standard Color Solid White Front Curb Integral 3"W * 3"H Flange 0.75" on Side and Backwalls Features: 1) Solid one piece construction; 2) Abrasion Resistant Gel Coat Surface 3) Seamless 4) Pre-leveled 5) Easy to install AIO HOSPITALITY SOLUTIONS has over 10 year experience to manufacture cultured marble shower surrounds, shower pan and accessories. We provide products directly for US hotel projects and apartments. After years efforts, KKR has got a good reputation in artificial stone field. 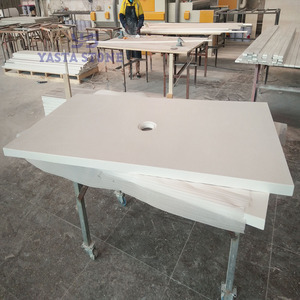 The surface is more glossy than solid surface material, and the color is bright, uniform, fastness, does not cause discolorartion. : 1. We own a one of the biggest sales team in the same industry. For FCL order, save every inch of space in the containers for you. 4. Stringent quality control, always responsable for our products. 6. Can your factory print our brand on the package9 Yes, we can. 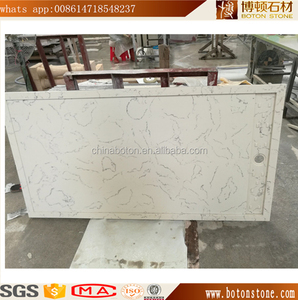 We are spelicize in Cast marble culture marble panel,shower pan,foot rest,accessories ledge our cast marble produtcts are well sell in USA . 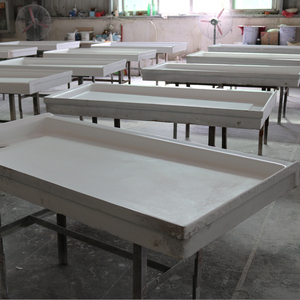 Cast marble manufactured directly from our facilities,customized cast marble panels and pans are available. , Ltd is one of the most leading manufacturer and exporter in the field of marble stone in China. 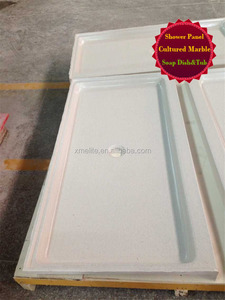 AIO HOSPITALITY SOLUTIONS has it's own factory to manufacture USA hospitality cast marble shower surround, tub surround, wall panels, cultured marble shower pan, shower base, shower tray, shower walls, cultured shower wall accessories, soap dish, accessories ledge, shampoo shelf, trim, foot rest, corner shelf Specification Product Shower Pan , Shower Tray, Shower Base Material Cultured Marble,Cast Marble Model Rectangle Shower Pan Dimension 60"x30"/32"/34"/36"x3", 48"x36"x3" Surface Textured, Non-Slip Drain Location Center Drain Drain Opening US Standard Color Solid White Front Curb Integral 3"W * 3"H Flange 0.75" on Side and Backwalls Features: 1) Solid one piece construction; 2) Abrasion Resistant Gel Coat Surface 3) Seamless 4) Pre-leveled 5) Easy to install AIO HOSPITALITY SOLUTIONS has over 10 year experience to manufacture cultured marble shower surrounds, shower pan and accessories. We provide products directly for US hotel projects and apartments. Xiamen Qinyuan Import and Export Co., Ltd.
-----Different sizes of outlet and inlet can be supplied according to cusotmer demand. 8)-----Different sizes of outlet and inlet can be supplied according to cusotmer demand. 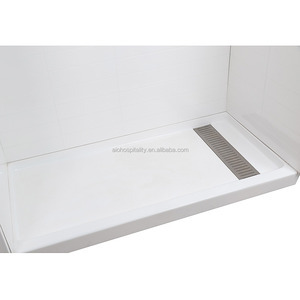 9)-----Floor mounted or wall installed, simple and stable, all accessories supplied, flushing effect is excellent.